The Chimayó valley is a verdant oasis extending from the foothills of the majestic Sangre de Cristo mountains to the expanse of the Rio Grande valley. In this fertile area, three streams meet and traverse its entire distance. People have been drawn to the valley’s charms both in prehistoric and historic times. Native Americans inhabited the piñon covered hills and chamiso strewn valley floor. The name Chimayó itself is from the Tewá Indian language meaning superior red flaking stone. The Cañada de Chimayó, as it is known in the early records, became increasingly settled by the Spanish after 1692. The Spanish Crown encouraged colonists from New Spain (Mexico) to move north, and many settled in the Chimayó valley. In 1693, Jose Jaramillo Negrete and his wife Maria de Sotomayor of Mexico City, came to New Mexico as colonists. Their son, Roque came as a soldier at the same time. Soon the many sons and daughters of Roque Jaramillo and his wife Petrona de Cardenas spread throughout northern New Mexico. Manuel Jaramillo, a son of Roque, acquired property in the upper Cañada de Chimayó in the early 1700s. In the 1800s, Manuel Jaramillo’s great grandsons, brothers Hermenegildo and Epifanio, assisted each other in building their own family homes. 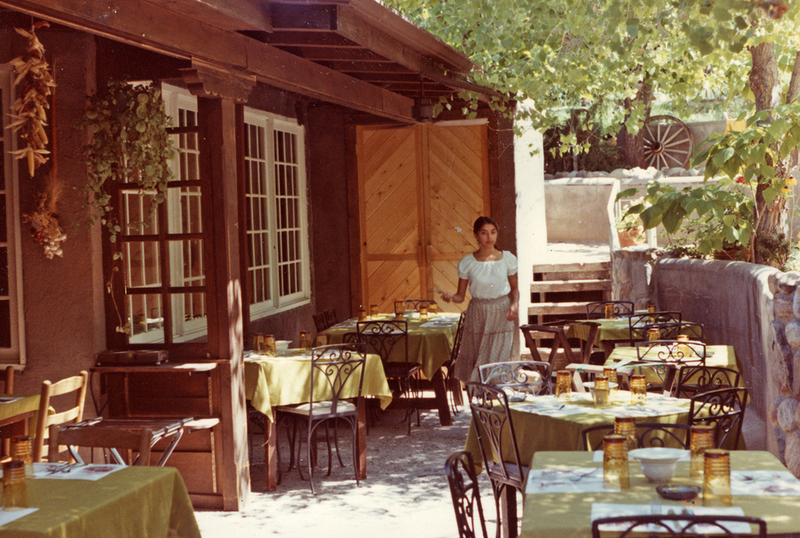 In October 1965, Arturo Jaramillo and his wife Florence envisioned a plan for the house built by Hermenegildo and Trinidad Jaramillo, and the Restaurante Rancho de Chimayó was born. Their restaurant would preserve the rich traditions of their family and its proud culture, welcoming guests into this comfortable and romantic piece of history. Fireplaces radiate warmth into cozy rooms and family photographs hang on the white washed adobe walls. The lovely terraced patio beckons you to exquisite outdoor dining. In August, 1984 the Jaramillo family completed restoration of Hacienda Rancho de Chimayó, Epifanio and Adelaida Jaramillo’s home. Their home has been lovingly renovated into seven guest rooms. Each room opens onto an enclosed courtyard and within each room one finds turn of the century antiques, a private bath, a quiet sitting area and fireplace. In July 2008, a fire at Rancho de Chimayó damaged the kitchen and other areas. After more than a year, the restaurant has been respectfully restored and upgraded, preserving the original adobe walls, structure and many of it’s authentic features. Rancho de Chimayó was honored as one of New Mexico’s Culinary Treasures in March 2014, one of only a handful of restaurants awarded with this wonderful distinction. The New Mexico Department of Tourism celebrated restaurants that have stood the test of time, independent spots that have become beloved in their neighborhoods and beyond. Many of these are operated by the founding family, or by someone handpicked by the founders to carry on their legacy. In all cases they are still family-owned and operated. 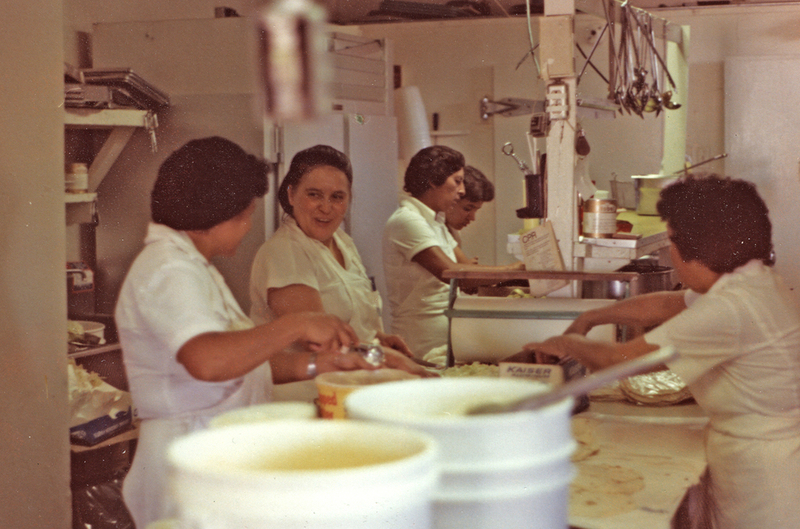 Our official 50th Anniversary Celebration date was September 19, 2015, when the Restaurante celebrated their 50th anniversary as a thriving, world renowned restaurant in Northern New Mexico. On May 2, 2016 at the Lyric Opera of Chicago, Florence Jaramillo and Rancho de Chimayó received the 2016 James Beard Foundation America's Classics Award. The James Beard Awards recognizes culinary professionals for excellence and achievement in their fields and further the Foundation’s mission to celebrate, nurture, and honor America’s diverse culinary heritage through programs that educate and inspire. On March 8, 2017, Mrs. Jaramillo received the first Women’s Restaurant Award given by the New Mexico Restaurant Association. This award was created to recognize women who have made outstanding contributions to the New Mexico Restaurant industry. Mrs. J was presented the award in conjunction with the National Women’s History Month. Not only did Mrs. J receive the first award, but the award will be known as the “Florence Jaramillo Award” in her honor going forward. On March 12, 2017, Mrs. J received Edible Santa Fe’s LOCAL HERO award in the “New Mexico Restaurant” category. The Local Hero Awards recognize amazing individuals and organizations for their work to create healthy, sustainable food systems in New Mexico. Businesses that received the award in various categories were determined through reader nominations and a reader poll. Join us at Rancho de Chimayó - a treasured part of New Mexico’s heritage and history and will always remain...a timeless tradition. From left to right: Laura Jaramillo Ross, Lauren Jaramillo Ross and Florence Jaramillo. Historic photos slide show continuously updated.